Thankfully, I wasn’t asked to try them both on. I may Twitter my Five Year Diary entries across the Net in a suitably retro 1970s format, though ‘got up, had a bath, watched TV, fed the rabbit’ isn’t too engaging. It gets better. I can’t share what I was doing in 1979. I also have my late Grandfather’s logbook from his period training as a fighter pilot in 1918. He’d just transferred from the Machine Gun Corps where he’d served through the Somme and Passchendeale. His handwriting is extraordinary. I’ll put up a photo. And my late Father’s logbook from his sailing days, first there was Canny Lass, then there was Serendipity. His car had the number plate STOIC But we don’t chose our parents do we? Why all this interest in diaries and log books? In 1999 I noted that there were 6000 diaries (sic) in diaries.net and 2000 in Diaryland few months after its launch. Having transcribed and uploaded 16000 entries I can now browse through a portion of thirty years or so as if I’d been blogging. I can call up several ‘essays’ on Net Journals and web-logs too. Having done so I can drill even further than I did at the time into the author’s cited. Courtesy of Google I can complete my research and indulge myself. There are some great diaries, great diarists and some useful books on the genre too; bloggers take note. I’m starting to look very closely through this content for the patterns that others would find too if they kept a simple diary, a basic, regular blog. There value comes with the passing years. I can find enough in what I have written to know who I was with and what I was doing on the 4th January between 1976 and 2011. I’m surprised how often there was snow in the 70s (this is Tyneside). On 4th January 1979 I crashed a car on ice heading for my girlfriend’s house in Wylam on the other side of the Pennines. The road from Brough to Bowes on the A66 was blocked with snow so I had to double-back via Carlisle and Hexham. In a world where a life of learning is expected and the technology makes it possible, keeping a blog, some private, some open, some themed must begin to pay dividends for the author who is actively engaged with the content, rather than simply letting the events of the past go by unaddressed. Blogs are such simple things, but surely, in their myriad of forms (you could say that Facebook entries and Twitter reports are as journal-like as any longer entry in a blog, or online magazine or other website) more could find educational and personal value in them? 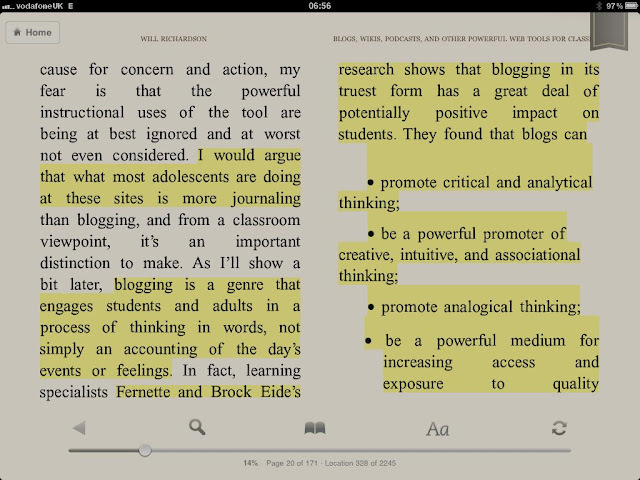 So how to persuade students to keep an educational blog? To form the habit? Promotion, example, and the devious inclusion on any course of a professional ‘catalyst’ who blogs and comments discretely and often to get then keep the blog ball rolling. 15828 views. That must be a new OU record, pretty amazing. But honestly Jonathan you deserve it, your blog is really a storybook blog. Rich of information, presented in an appealing way to a variety of audience, seasoned with some emotions, and reflections. By Jonathan Vernon in Blogging, Diary, E-Learning, H808: The E-Learning Professional, Scrapbook, Secondary Education, The Open University, Words, Writing on January 11, 2011 .